Beds are equipped with mosquito nets, fans and a couch. Flintstones Backpackers which was previously known as Kuomboka Backpackers is a secure, relaxing, state of the art guest house in Lusaka, the capital city of Zambia. The guest house is situated just 1 km away from the main town of Lusaka and is strategically placed near hospitals, banks, shopping malls, bureau de changes and important landmarks in Lusaka which our clients can tour and explore such as museums, cultural centres, recreation centres, restaurants and for the party freaks we have state of art night clubs such as Room 101, Vegas Lounge and News Cafe' at arcades just to name a few. The Flintstones backpackers Lusaka offers 13 private rooms, 30 beds in 3 dormitories and camping facilities, all priced at very competitive rates. Free travel advice, 24 hours checking in, DSTV in the rooms, Camping, Laundry services, There is also a fully stocked bar, a place where u can enjoy and shoot some pool, Restaurant at the lodge, with self-catering facilities available to guests, Secure 24hr car park and 24/7 security, Hot water in showers and bathtubs, Guests will not lose touch of their social lives, information or business back home as Flintstones backpackers Lusaka is equipped with a WiFi hotspot, offering fast and reliable internet facilities 24/7. 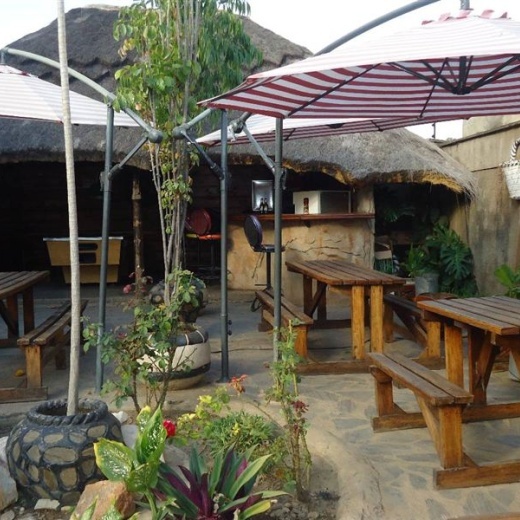 Flintstones Backpackers is less than one km from Lusaka City center.